Part of being a Daring Baker is trying things that might not turn out. This night has turned into a comedy of errors and what I had hoped would be a post about a lovely strawberry mirror cake has ended (hopefully temporarily) with a picture of my extremely curdled bavarian cream. I ran out of sugar and gelatin, but I'm hoping I can salvage my cake circles, strawberry puree, strawberry juice, and everything else I have already made and try finishing it tomorrow. Not quite on time, but I can't stop now, can I? Otherwise, I might drink strawberry juice for breakfast and call it good. I'm breaking my usual posting schedule (every Monday) to post about the Harry Potter themed treats I made to bring to work today. One day I was bored and went through and wrote down all the mention of food in the Harry Potter books, in case I ever wanted to do a themed meal. I started poking around and discovered that fantastically named items such as treacle tart were real desserts, with real recipes. I honestly thought it was made up! 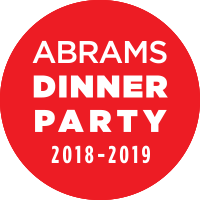 These days, an excellent source for Harry Potter recipes and party ideas is PotterParties.com. I made a treacle tart and pumpkin pasties last night. 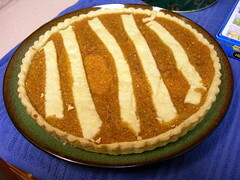 The treacle tart recipe was this one from the BBC web site, but it has already moved once so I'll post it again. Treacle is another name for golden syrup, which is like a light golden molasses - almost the color of corn syrup, but with a much nicer flavor. It is the key ingredient to many desserts in the UK, including sticky toffee pudding, which I was tempted to make instead. But I couldn't pass up the chance to make Harry Potter's favorite dessert! This recipe includes lemon and ginger, and these flavors combined with the treacle create a dessert I imagine would be much more pleasing to the adult palate than a child's, but wizards may have different tastes than muggles. You can make this with a shortcrust recipe, but as there isn't much difference between that and pie crust, and I had already made a huge batch of pie crust for the pumpkin pasties, I used the same thing. I wish I had spent more time with what I put on the top... it looks a little horrid, but it tasted good. The treacle mixture becomes chewy which is a nice contrast to flaky crust. Definitely try this recipe!! 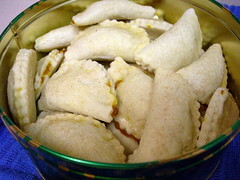 Pumpkin pasties are something I had read about and came up with my own recipe for them. I'm sure they're not much different from the other recipes you might find, but they are delicious and simple. One student said they were like mini pumpkin pies, which is a good way of looking at it. Pasties in general are hand-held pies, but these are even tinier than that! Roll out pie crusts and cut into circles. Brush one side with egg wash. Put small amount of pumpkin pie filling in center. Fold over and pinch together. Brush with egg wash and sprinkle with powdered sugar. Bake at 375 F 15-20 minutes, or until crust is golden brown. *If you can't find pumpkin pie filling, if it's not "in season" - combine canned pumpkin with spices and a little brown sugar, and you'll be fine. 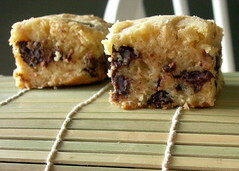 I found this recipe on one of the baking blogs I frequently read. Tartlette is a formally trained pastry chef who makes the most beautiful things, and her photographs are always stunning as well. She is the type of baker I aspire to become, maybe after another 10-15 good years of practice. These brownies are not the typical blondies - they are made by melting white chocolate and mixing it with other ingredients. I was impatient and cut them before they were completely cool, but if I made them again I would force myself to wait. They are sweet, light, and wonderful. I have been thumbing through the new cookbook Vegan Cupcakes Take Over the World for probably a month now. I needed to gather all the necessary ingredients and pick a flavor - you won't believe the amazing cupcake recipes in this book. Tiramisu, smore, mocha hazelnut, etc. - everything sounded delicious and fun. The main ingredient I didn't have was vegan non hydrogenated shortening. I don't stock shortening in general, much less vegan or non-hydrogenated. But if you can't use butter, shortening is sometimes a necessary evil. 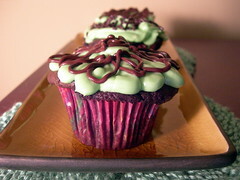 Pawing through my cupboards I realized I still had some mint extract, so I went with chocolate mint cupcakes. For the cake part, it is the recipe for "Your Basic Chocolate Cupcake" with mint extract added. That is the recipe I'll include here, but really, go out and buy this amazingly fun book. 1. Preheat oven to 350 F and line muffin pan with paper or foil liners. 2. 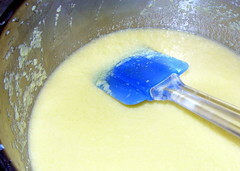 Whisk together the soy milk and vinegar in a large bowl, and set aside for a few minutes to curdle. Add the sugar, oil, and extract(s) and beat until foamy. In a separate bowl, sift together the flour, cocoa powder, baking soda, baking powder, and salt. 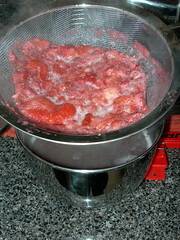 Add in two batches to wet ingredients and beat until no large lumps remain (a few tiny lumps are okay). 3. Pour into liners, filling three-quarters of the way. Bake 18-20 minutes, until a toothpick inserted into the center comes out clean. Transfer to cooling rack and cool completely. Cream together, spoon into a pastry bag, and pipe onto cupcakes. Or spread with knife. I did some in zigzags, some in flowers, and some in spirals. I melted some chocolate chips in another ziploc bag, cut a small part out of one corner, and drizzled some on top in patterns to match. Some of the cupcakes have chocolate sprinkles. Jenny's notes: I have to admit that the cupcakes pictured in the cookbook were all a little too small and flat for me, so I may have added extra baking powder for a little more height. As a result I had some slightly messy cupcakes, but they still taste amazing. There is nothing noticably vegan in these cupcakes. They taste chocolately, minty, and the "butter"cream icing is actually very good, despite my predisposation against shortening. I also didn't have apple cider vinegar, so I used white distilled. I find I can only have so many flavors of vinegar on hand, you know? At last count, I had five, and apple cider was just not one of them. It's okay to substitute one vinegar for the other since you are using it for its chemical properties, not its flavor, when you are baking. Just be careful not to use one that has a pungent flavor where it might not belong. Chocolate mint cupcakes would not have been balsamic-friendly, for instance. I found these to be a little melty, and not just the ones I put in the light to photograph. This means I'll have to find room in my fridge overnight for them, which is not that great of a scenario at the moment. Next time I would add more powdered sugar, or just forget the milk entirely in the icing. I also needed to bake these longer than 20 minutes, probably more like 23, but I did have more batter than recommended. Strossners Bakery is located in Greenville, SC. It seems like one of those bakeries that has been around a long time (and the web site says over 50 years) - most of what they make is traditional bakery fare - bread, danishes, cakes, pastries, cookies, etc. Our first experience with them was about a year ago - we had just moved to town and it was going to be my birthday, so we stopped by and picked up a cake. They have so many full-sized cakes ready to go at all times that it took some time to decide, but I remember getting the Triple Chocolate Torte. It was okay, but I've never been a fan of the fudgy icing since my cake decorating days (it tends to be a little plastic in texture). Since then we have been back to eat at the deli, pick up an occasional breakfast pastry (the almond danish is highly recommended, best I've had), etc. 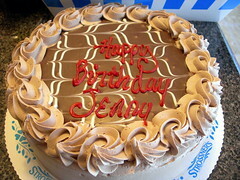 This year for my birthday I picked the Bailey's Ganache Cake. Both my husband and I like the flavor of Bailey's, and I thought it would be amazing with chocolate. Inside the cake are three chocolate cake layers, spread liberally with Baileys, filled with chocolate ganache and the outside is topped with a whipped ganache. It was really good. The downfall of commercial bakeries is that they have to add ingredients to things like icing to make them last longer, so the outer icings were a bit rubbery in texture, but I felt the flavor made up for it.